Oh, isn’t it grand to see The Good Wife get back in the normal swing of things with an episode about a very popular social media site? Well, no, not exactly that site, but a close replica with a similar name. In my notes I just decided to call the website “Reddit,” because I couldn’t remember the silly clone name they gave it (it was Scabbit, guys. Scabbit. Let’s all laugh about that forever and ever, amen). Yes, the Lockhart/Gardner vs. Florrick/Agos battle is ongoing, and yes, we had a silly political plot as our C-story, but Scabbit was the star of “Whack-A-Mole” and rightly so. Ripped from the headlines, as it were, “Whack-A-Mole” is inspired by the subreddits that searched for the perpetrators of the Boston marathon bombing and eventually turned into a bit of a misguided witch hunt. I have no idea if any lawsuits actually resulted from that whole situation (wouldn’t be surprised if it did), but the very concept of Reddit is a fascinating one from a legal perspective. It’s such an unsupervised, anonymous playground, but it’s also one of the most-viewed things on the internet. The power wielded is extraordinary, but extremely difficult to control—which is part of the appeal, of course. 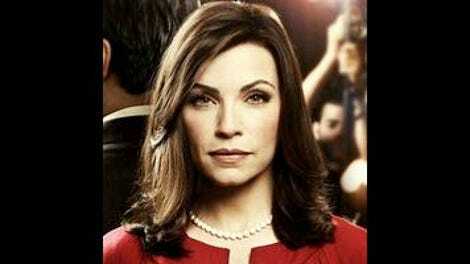 In The Good Wife universe, there was also a terrorist bombing in Milwaukee, which Scabbit users are investigating. Just as the show has both ChumHum and Google exist, the Boston bombing is also mentioned, which is a necessary evil for the show—it can’t fictionalize events around such a fresh and searing tragedy, but it also can’t pretend that those events never occurred. The Scabbit investigation has turned the FBI onto an innocent man, Zayeed (Haaz Sleiman, who I know best from Thomas McCarthy’s The Visitor) and Alicia and Cary sue to try and stop the online investigation. Perhaps the weirdest wrinkle of all was the final scene, where Tambor (George Kluger is his actual name) asks Alicia out on a date. What!? He doesn’t know she’s married to the Governor? Sure, there’s rumors of sleeping in separate bedrooms or what have you, but this is a bonkers thing for someone to do. I guess… we’ll see where that goes. Their rapport had been established, but I was still taken aback. Over at Lockhart/Gardner, Will makes an impulsive new hire, a bruising lawyer for criminals played by Jason O’Mara—who seemingly dropped right out of The Boondock Saints (that is not a compliment). I have always thought O’Mara was a fun enough actor, but it’s crazy how hard TV has tried to force him on us. Over the years, he’s had guest stints or starring roles in Grey’s Anatomy, Men In Trees (remember that one!? ), Life On Mars, Terra Nova, Vegas, the list goes on and on. Well, here he is again, sporting his natural Irish accent this time. His character, Damian Boyle, is a shifty sort who represents all sorts of dodgy criminals and thinks the best way to deal with Florrick/Agos is to steal their office furniture. I didn’t hate any of his scenes, but I’ve been reviewing this show long enough that an alarm bell immediately started ringing in my head, and jumped to turbo when he flirted with Kalinda. Does Kalinda need a third aggressive male love interest, after Blake from season two (ugh) and he-who-must-not-be-named from last year? I say she does not. I don’t know if the firm needs Damian Boyle, but we will see. At least he’s kinda funny. Anyway, as silly as this storyline was, props to Mary Beth Peil for nailing her emotional material, more than she usually gets on this show. The wound being dredged up was an old one, but still fresh enough in her mind, and one she wanted to keep buried. Her maneuvering to keep Rachel out of the judgeship was aggressive and a little scary, but we understood her motivation. More Jackie storylines like this wouldn’t be untoward. And, hell. The Judge. Let’s never forget about The Judge. I know Reddit doesn’t have “pimp points,” but maybe it should.